Allied Oil knows that you need a reliable and cost-effective fuel delivery partner to maintain your growth. Therefore, you can count on Allied Oil to deliver diesel fuel, gasoline, fleet fueling and heating fuel to over 250 New Jersey cities. Furthermore, we can also provide trucking services state-wide. Our company provides diesel delivery for fleets of equipment, trucks and buses, and we keep them all moving without a hitch. Whether you need diesel fuel delivery service for a few weeks, months or ongoing, we've got you covered. In addition, our inventory monitoring system can ensure that your tank never runs out of diesel fuel or gasoline. Know what's in your tank every day and eliminate downtime! Most of all, our goal is to keep your crew busy and productive with a full tank each morning. Choose Allied Oil for reliable diesel delivery and fuel monitoring. Allied Oil markets and distributes a full line of branded & unbranded gasoline products. No matter the volume of gasoline your station turns over each day, Allied's large fleet of delivery trucks are ready and able to fill your fueling needs. Off road diesel, on road diesel, premium and winterized diesel fuel delivery to your job site, fuel tanks, construction equipment and generators. Onsite diesel fuel pumped into your jobsite equipment, your tanks or loaner tanks to keep you project moving without any downtime. Three grades of branded and unbranded gasoline fuel delivery to gas stations, businesses and municipalities throughout the state. Open an account with Allied Oil, and save time and money. We make it easy for you to get your fuel delivered on demand. Download our credit application and we'll get back to you quickly. Fuel hauling and heaving equipment hauling with our state-of-the-art tank trucks and specialized hauling equipment. 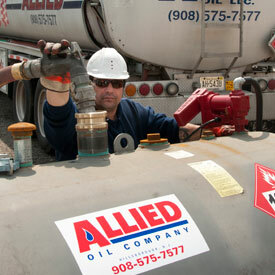 Allied Oil is currently hiring qualified drivers for full time & part time work. We’re busy year round, with only minimal seasonal work, & year round opportunities for overtime. Allied Oil has been a major NJ fuel supplier of petroleum products including diesel fuel, gasoline and heating oil since 1925. We reliably provide commercial fuel to businesses and industries throughout New Jersey. Our goals are very simple: provide dependable, on-time fuel deliveries at competitive prices. Most of all, it's our people who make the difference. The three links below will take you to some important information regarding our business focus, and where we serve, showing you over 250 SERVICE AREAS. Allied Oil specializes in serving the fuel needs of New Jersey's commercial businesses. We can keep your business fueled and ready to go every morning. Ask about our fuel monitoring system to keep your fleet fueled and ready to work.